Sam graduated from Bristol University in 2008 and spent a year in general practice before embarking on a rotating internship followed by an anaesthesia and pain management internship both at the University of Bristol. Upon finishing these Sam enrolled on the BSAVA certificate in Small Animal Surgery while working in a busy hospital and completed this with distinction in 2015. 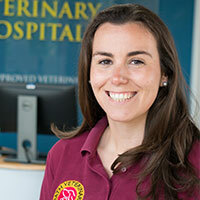 She joined the Bath Vet Group team as a referral surgeon in February 2017. Sam enjoys walking her Golden Retriever on the Jurassic Coast.